(May 24, 2018)—Recently, the Government Accountability Office (GAO) conducted a study on Medicare prior authorization requirements. The requirements began in seven states for certain power mobility devices such as power wheelchairs in 2012. The categories later expanded to include DME, home health and others. Some programs, such as the DMEPOS program are permanent, and others, such as home health, are paused. The states covered under prior authorization demonstrations reflect high utilization areas of concern. On May 21, 2018, the GAO released their findings publicly with the recommendation that prior authorization continue across industry categories, prior to some programs expiring. We are pleased to announce New Rental Service for manual and power wheelchairs, mobility scooters, and other medical equipment. Please review available rental options and call us to complete your order or ask further questions. 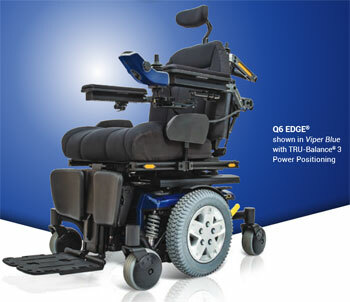 With features like standard 4-pole motors, Mid-Wheel 6® drive design and ATX Suspension, the Q6 Edge® is engineered to meet the performance needs of the most active user. The Q6 Edge accepts a complete range of seating and electronics options to deliver exceptional rehab capability at an excellent value. Ask us for more details!